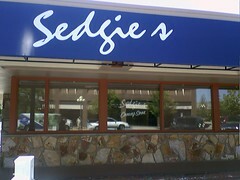 Looks like we may have a new restaurant in Great Falls: Sedgie’s! What a cute name! It’s located in the spot formerly known as Rio Ranch Grill, and before that Portofino’s. No idea what kind of restaurant it will be…do any of you know? Or when it will open? There was an article last week in the Tribune about it. Mediterrean/American fusion I believe it said. Can anyone keep me posted on this place? I’d really appriciate it as I don’t live in Great Falls anymore and it looks like a great place.